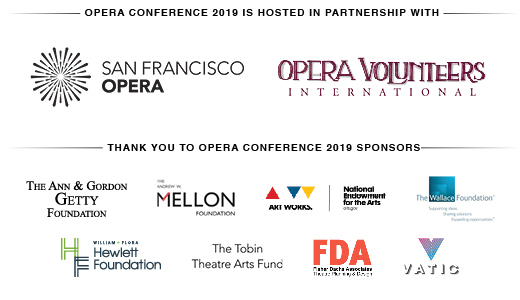 OPERA America and San Francisco Opera invite you to the Golden Gate City for Opera Conference 2019, the largest and most important annual convening for opera administrators, artists, trustees and volunteers. Examining Traditions: Traditions shape our canon, dictate our performance customs and define our art form. Is it time to reinterpret the repertoire, adjust our practices and introduce new ideas into the evolution of opera? Exploring Business Innovation: The Bay Area has changed the world with innovative technologies, entrepreneurial models and creative management strategies. Can new and disruptive practices transform the opera business as well? Deepening Civic Practice: Opera has the potential to strengthen the civic fabric of our communities. How can building authentic partnerships bridge divisions and address shared priorities to improve our cities? More than 600 attendees will gather in San Francisco this June to gain inspiration, new ideas and connections to colleagues that will fuel their work throughout the year. Art at the Center. With the Robert L.B. Tobin Designer-Director Showcase, New Works Forum, a Composer/Librettist “Pitch Session,” a presentation by Ópera Latinoamérica, three San Francisco Opera productions and a sneak preview of Jake Heggie and Gene Scheer’s latest work, there are many opportunities to experience and discuss the creative dimensions of our work. Meaningful Connections. Conference attendees come from every area of the opera business, at all levels of experience. You will meet colleagues who share your challenges and motivations and build relationships that last long after you return home. 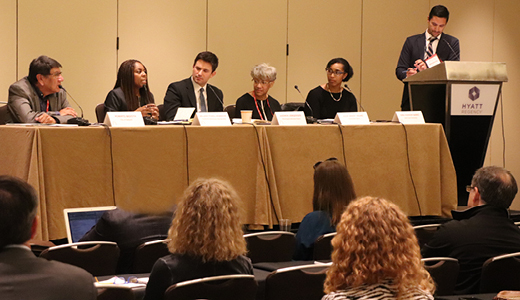 By partnering with OPERA America and San Francisco Opera, sponsors will have the opportunity to meet hundreds of clients, colleagues and prospective customers at an array of conference sessions and networking events. For more information about raising your company’s profile at the conference, download the prospectus and contact Vincent Covatto, organizational membership manager, at VCovatto@operaamerica.org or 646.699.5237.